Tundj Hata, the imperial courier, is charged with transporting heads to the capital--a task he relishes and performs with fervor. As he travels through obscure and impoverished territories, he makes money from illicit side-shows, offering villagers the spectacle of death. The head of the rebellious Albanian governor would fetch a very high price indeed. The Traitor's Niche is a surreal tale of tyranny and rebellion, in a land where armies carry scarecrows, state officials ban entire languages, and the act of forgetting is more complicated than remembering. ISMAIL KADARE is Albania's best-known novelist and poet. Translations of his novels have appeared in more than forty countries. He was awarded the inaugural Man Booker International Prize in 2005, and the Jerusalem Prize in 2015. JOHN HODGSON studied at Cambridge and Newcastle and has taught at the universities of Prishtina and Tirana. 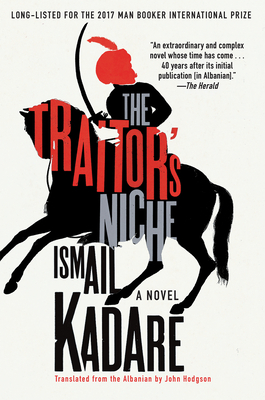 This is the fifth novel by Ismail Kadare that he has translated.